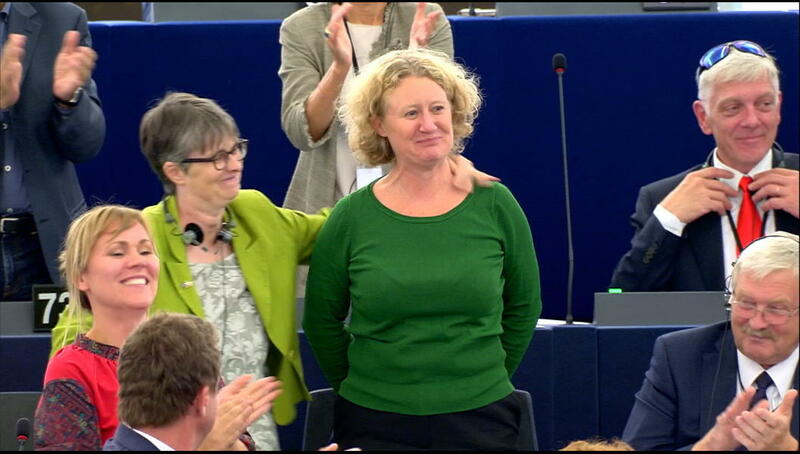 Dutch MEP Judith Sargentini was give a standing ovation in the European parliament on Wednesday after MEPs agreed to take disciplinary action against Hungary on the basis of a report she compiled. Parliament voted to take steps against Hungary over breaches of the EU’s core values, including attacks on the media, minorities and the judiciary. More than two-thirds of MEPs backed the censure motion – the first such vote against a member state under EU rules. If national leaders also support the motion, Hungary could face sanctions and be stripped of voting rights. Sargentini said later the decision sent out an important message about citizens’ rights. ‘It is up to the European leaders to take their responsibility and stop watching from the sidelines as the rule of law is destroyed in Hungary,’ she is quoted as saying by the BBC. Prime minister Viktor Orban said Sargentini’s report was ‘abuse of power and included ‘serious factual misrepresentations’. Dutch anti-Islam campaigner and MP Geert Wilders described the vote on Twitter as ‘a bloody shame’. ‘Orban is a hero and deserves the Nobel Prize,’ he said. I am so proud that my Hungary report has the support of the European Parliament, but this is foremost about the rights of Hungarian citizens. I thank my colleagues that stand for the protection of democracy and the rule of law, above their interest in party politics.